In recent weeks there’s been a lot of focus on Greater Manchester’s future transport plans. Mainly it’s been about further Metrolink extensions utilising Tram-train technology. Tram-train is where light rail unites (trams) can utilise heavy rail lines alongside ordinary trains. It’s in common usage on the continent, but, until recently, it wasn’t permitted in Britain for safety reasons. However, all that changed with a Tram-train pilot scheme over the Pennines, where the Sheffield Supertram has been extended to Rotherham by sharing heavy rail lines with conventional trains. For Greater Manchester it could mean a massive expansion of the Metrolink network without the cost of a single extra piece of track having to be laid; and the Government seems very keen on our Mayor, Andy Burnham, just getting on and doing it. For my constituency, it means opening up the passenger line through Fairfield and Guide Bridge to Metrolink trams as well as the current train services. It would also involve the creation of a new station in Dukinfield called ‘Dewsnap’ for these services. Likewise, Denton station (with its current one passenger train a week) could see Metrolink services linking to Stockport too. Now this is all great, BUT for most people, the main form of public transport is – and will remain – the bus. Devolution has given the Mayor powers to introduce a London-style regulated bus service in Greater Manchester. We’ve not had these powers since 1986 when the Thatcher Tory Government introduced competition through bus deregulation. A decade later, the Major Tory Government demanded GM Buses’ final break-up into two companies and their subsequent privatisation. Since then, the private network in the north of the conurbation has been dominated by First, with Stagecoach operating predominantly in the south, and scores of other smaller companies trying to milk the cash cow too. And that’s the problem: our bus network has been creamed off with only the profit-making commercial services retained by the bus companies, and the non-profit (but crucially important) ‘social’ bus services axed unless we pay out an ever increasing ransom… I mean subsidy. Worse, with a multitude of operators all in competition with each other, and a confusing myriad of prices and ticketing structures, our buses no longer operate as a network, and they certainly don’t integrate with other modes of travel. Now the game is up on this money-making scam, the private operators are begging they’ll change their ways and coordinate as a single network in the private sector (when they’re not threatening to sue). I don’t believe them. They’ve had over 30 years to do this and they’ve never put the public interest before profit. 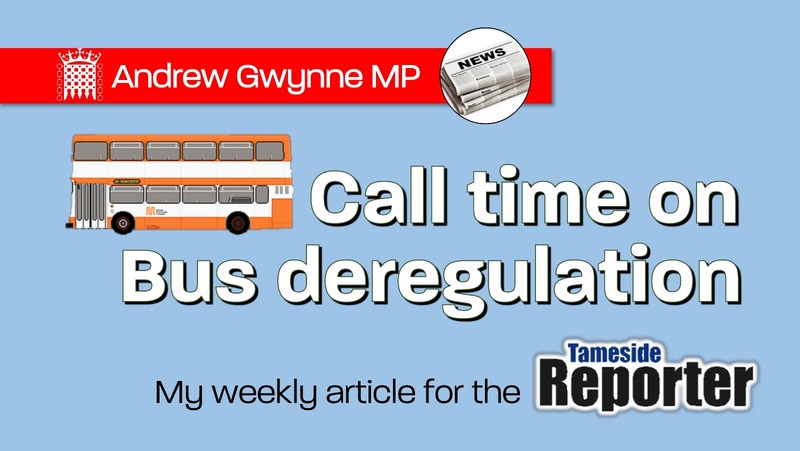 It’s time to call an end to bus deregulation and to use the Mayor’s new transport powers to give all of my constituents a world-class integrated public transport network.